Photographer: Ben Hassett. Model(s): Ling Liu. Source: Vogue China. Stylist: Charles Varenne. Makeup: Isamaya Ffrench. Hair: Peter Gray. 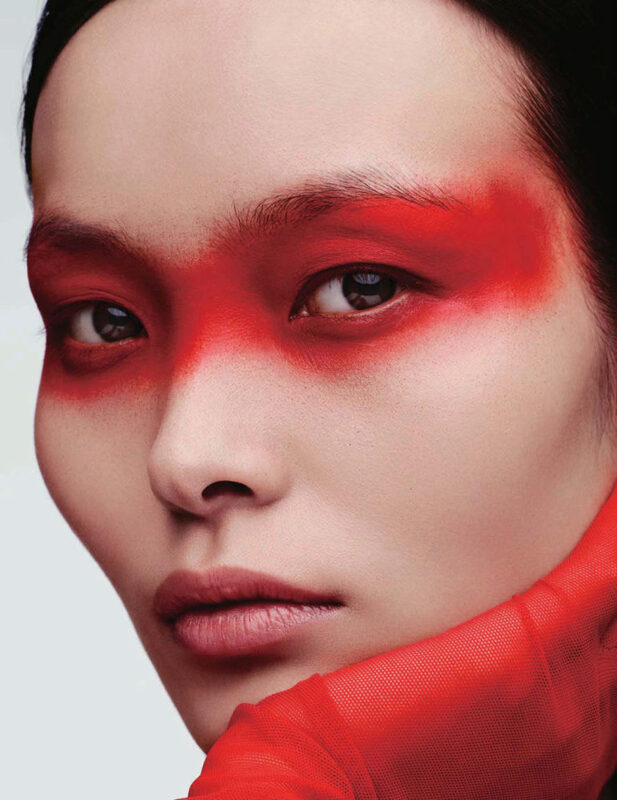 Ling Liu looks back to see ahead by Ben Hassett for Vogue China, September 2017. The art of beauty burns bright as the fire of the modern female takes the stage. Celebrating the cultural relevance and historical tradition of ancient beauty regiments. There’s a vigor and energy to this piece that sets the stage for this season. Stylist Charles Varenne uses a variety of silk and lace to fall against the face, allowing the materials to meld with the skin. History chronicles these classical beauty customs and diverse makeup forms that have been around for centuries. He honors this long-standing tradition by creating a modern interpretation of classical beauty customs. Hassett embarks on a journey to home in an ode to the art of Face-Painting. This isn’t simply a story based in historical application techniques, rather, it’s about the preservation of long-held cultural traditions. Isamaya Ffrench does what she does best, she allows the skin to tell the story. Walking the line between preserving and exposing can be a tenuous track, however, this artists’ abilities reach far beyond the cultural divide. Beginning with the decadence of red, we have highly pigmented tones that are wholly extreme. The vibrancy of this color rests in it’s ability to rise. That’s to say, the buoyancy of this bend knows no end. Somewhere between candy-apple and scarlet there lives a happy medium. Like paint dripping down the palate, so is this shadow, lying on the lid in liquid form. The look is amazing, with her eyes closed the image is more intensified. 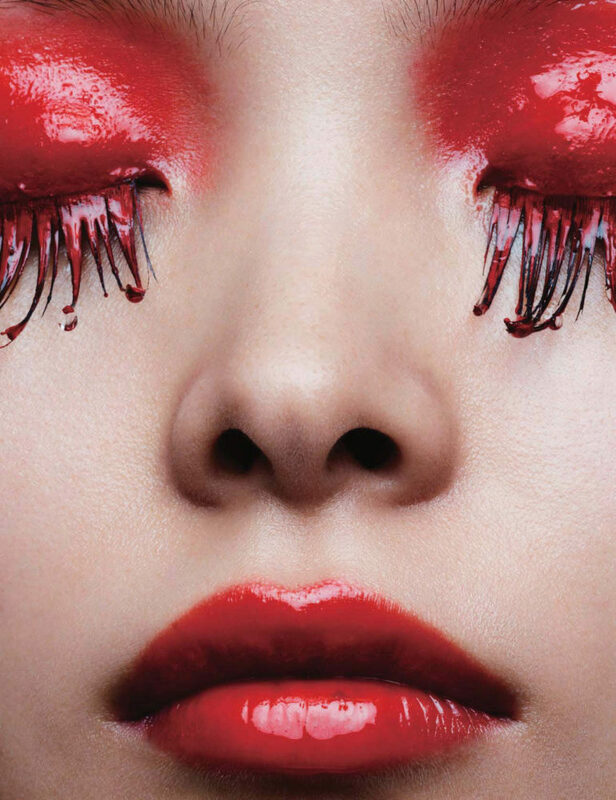 Drenched in rich red, color completely covers every individual lash. A visual masterpiece. Her eyes are so intense, one gets the feeling that the lips have simply soaked up the remaining saturation. Liu tips her head back, exposing her beautiful bone structure. Artfully portrayed under the brilliance of a bright, red lamp. Her chest, neck and lower face are hidden in the dark, while her eyes come alive under the deep scarlet glow. Ffrench doesn’t allow this opportunity to pass her by, instead she uses the shadowed remnants to silhouette her faux lashes. Long shadows come crawling out like spiders legs growing from her eyes. The picture portrayed is both dramatic and divine. 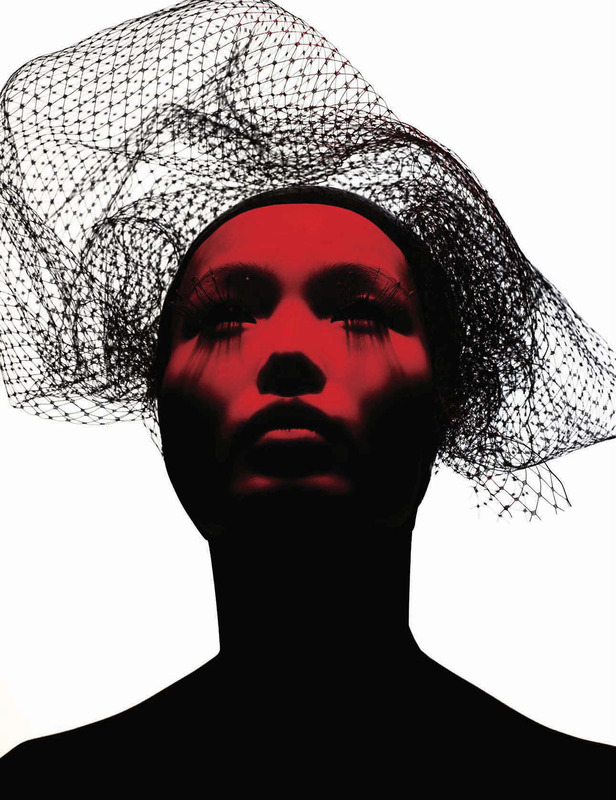 Covered with a black cap her hair is as if it’s not there, only to be topped by a piece of netted sculpture attached to the top of her head. An altered cat-eye settles on the right lid while the same color is drawn inside the left line. Backed by a solid red wall she appears gorgeously geometric. The next image has her standing under a silk scarf, with her eyes closed in front of an all red wall. Her features barely show up under the silken material, leaving behind rare results. Softness falls over the face emanating forth a subtle softness, while the sweep of fabric is done is dramatic form. Lifting each other up, the opposing combinations work to elevate the entire editorial. Similar to all of the images preceding this one, none are done with any color but one ~ RED. That’s to say, this piece portrays the pigment of one source. Rich in vitality, the energy radiates throughout the page. Delivering a masque like effect the look is done with a shadowed airbrush. 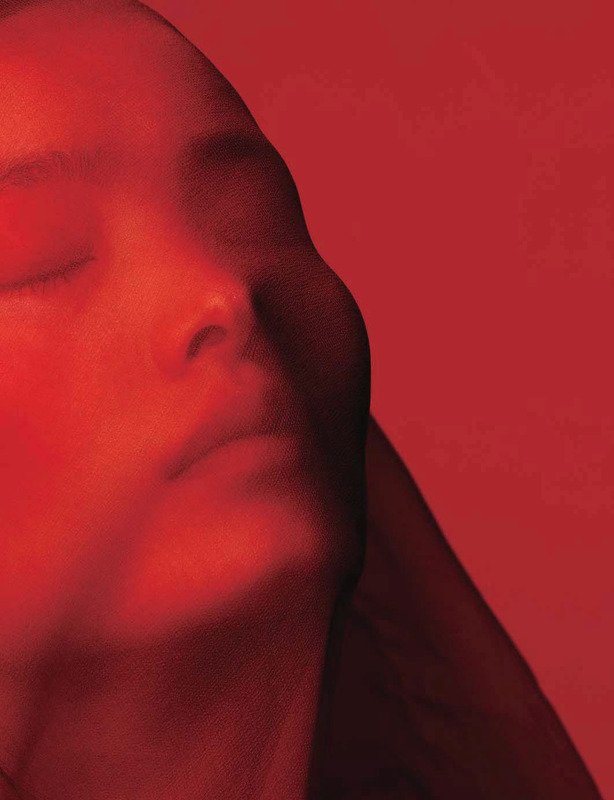 Drama defines the scene… by leaving the lips bare Isamaya brings on an aire of mystery. And then there was one. An image so compelling we can’t help but to be in awe. Ling’s looks may be a modern interpretation of this cultural trend, but in the end we are left with the Beauty of the Geisha. 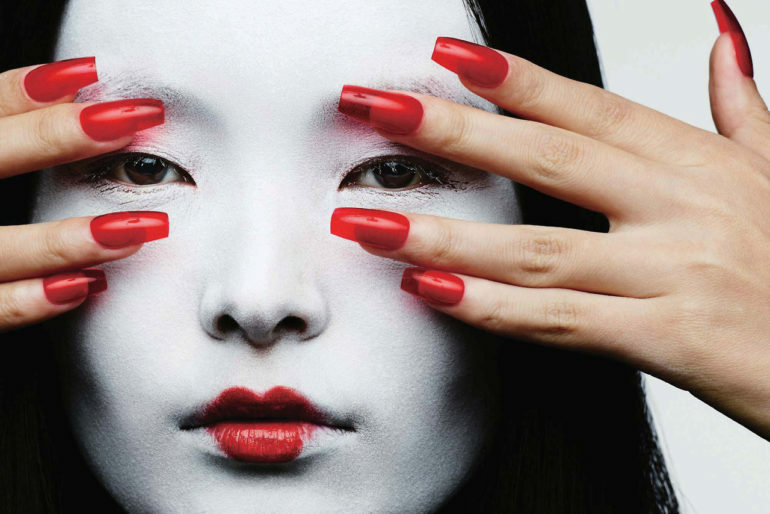 Her scarlet nails pop against the starkness of the face, while the white pallor is done in a traditional manner and the powdered masque touching every inch of skin. Matching in perfect harmony, her lips are delicately drawn in a heart like shape, smaller than her natural line. This story melds the past and future with exquisite aplomb.